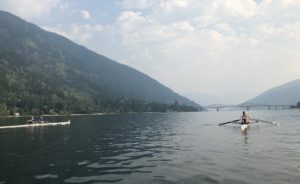 This summer, Rowing BC’s Summer Students, Natasha and Matthew, took a tour around the province with the goal of giving as many people as possible the opportunity to row. Some of the places they went to included Ucluelet, Ahousaht, Sidney, and Kelowna among others! These events gave both current rowers the opportunity to try a different medium of the sport, like coastal, as well as the opportunity for non-rowers to try out some beginner-friendly boats! We caught up with them and asked them to share some of their experiences over the summer with us. 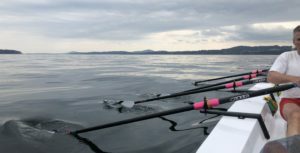 “At the beginning of the summer, we were tasked with supporting the promotion of the upcoming Coastal World Championships in Sidney this fall, but when we began reaching out to communities to host Come-and-Try sessions we realized there was so much interest and potential in bringing rowing to areas that don’t have established clubs and resources and to clubs that are looking to grow their membership. This led us to shifting our focus to bring rowing to as many communities as possible. 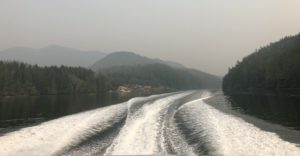 We loaded the trailer with as many recreational boats as possible, hooked it up to the truck and headed out across the province. We drove nearly 4,000km in over 50 hours to visit seven different communities and engage with nearly 200 people. We had so much fun visiting so many amazing communities throughout BC! We got to visit lots of different rowing clubs, getting to really experience the full spectrum of what rowing looks like across the province – We even got to visit some of Rowing BC’s newest member organizations, Lillooet Rowing Club on Seton Lake and Open Aviron Rowing Coastal Association in Sidney. Every community had so many beautiful waterways and unique characteristics that lended well to running successful events. Some of the places we visited didn’t have established rowing clubs yet, but had members in the community that were eager to offer new rowing opportunities to community members. We also saw a lot of wildlife on our journey. We saw a wolf hanging out on the beach in Ahousaht, spotted some whales in Sidney, and rowed within meters of black bears in Ucluelet. But the highlight of our journey was definitely the people. From lifelong rowers, coaches, umpires and rowing parents to participants who had never seen a rowing shell before, our summer tour allowed us to engage with people with a passion for rowing and a commitment to helping the sport grow across the province. We couldn’t have done it without the amazing partners we had in each hosting location and without the many clubs who generously allowed us to use their trailers, boats and oars. A huge thank you from Rowing BC to both Natasha and Matthew for all their hard work this summer!